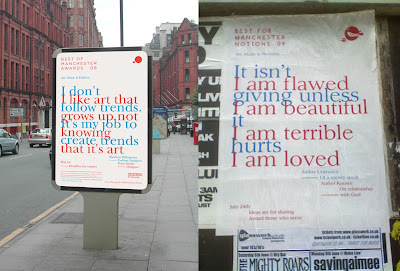 The people who run the Best of Manchester Awards are looking for the mysterious person or persons who did these spoof BOMA posters (The poster on the left is the real thing, the one on the right the spoof). They swear up and down that this is not a clever publicity stunt, they genuinely have no idea who made 'em, but they'd like to include the spoof posters in the exhibition later this summer. So they are asking the blogging community to help track down whoever's responsible for this clever bit of culturejamming. And I just noticed as I was typing this that Chris has put a similar post up at Mancubist. They promise that anyone who helps them with a bit of detective work will get two free invites to the BOMA awards party. Email marketing at urbis dot org dot uk. Now I'm curious. Any idears? As it happens, BOMA announced the shortlist earlier this week, which makes for interesting reading. Some familiar names on there, some surprises. But mainly it's nice to see folks who have been labouring quietly away for years get some recognition for all the all-nighters they've pulled in the service of art/music/fashion. And no, I'm not going to say who I want to win. That would spoil it. Winners announced at Urbis on 23 July. This is really starting to bug me now...WHO did the posters?! I have my suspicions. Ta for the post, tho. I actually know who did this but I don't know if he wants to become known... he has been posting around Manchester for a long time now and you will definately have seen his posters around... the mystery continues!